Acute cardiac ischemia, which often leads to lethal ventricular arrhythmias or heart failure, is diagnosed based on shifts of the ST segment of the electrocardiogram (ECG). These shifts can be observed in leads close to the ischemic region. In the course of this pathology, electrophysiological properties of the affected tissue alter. As a consequence, also the ST segment shifts vary at different ischemia stages. Furthermore, regional heterogeneities depending on the transmural extent of the ischemic region or on the occlusion site also have an impact on the changes of the ECG. In this project, the first 30 minutes after the occlusion of a coronary artery are investigated in silico. 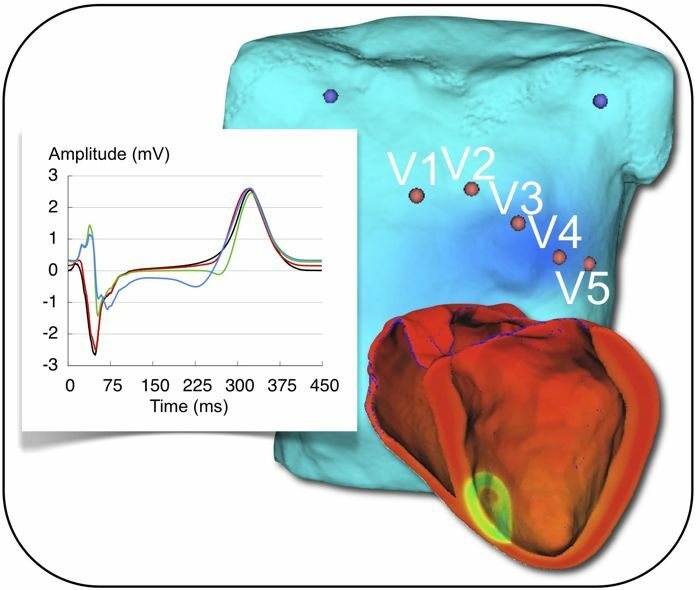 For this purpose, a modified human ventricular cell model simulating acute ischemia effects is used. Heterogeneous ion channel conductivities and kinetics, as well as spatially and temporally varying ischemia effects are considered. A model of human ventricles of a healthy volunteer is used for the simulations. The transmembrane voltage distributions are used to compute the corresponding body surface potential maps and ECGs. There, ischemia related changes can be observed to better understand and improve the early diagnosis of this pathology.